Mellander Maple will be here with their maple syrup and Nunda Mustards. Pegs Produce will be here Farm market bouquets, fresh lavender, plants (hens and chicks, sedum, basil, oregano, eucalyptus and more), hanging baskets, and lettuce. Phillips Organic is bringing Organic mixed greens, rainbow Swiss chard, blueberry and gooseberry vinegars, and French breakfast radishes. 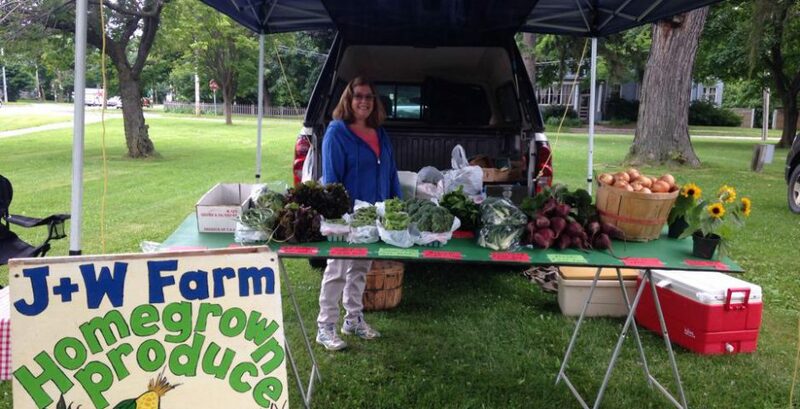 Nice Farms has sweet cherries, raspberries, and apricots this Saturday. Along with their Pasture Raised Pork and Beef, Maple Syrup, Maple Products, Herbs and Dip Mixes. JW has green beans, yellow beans, broccoli, zuchinni, yellow summer squash, cucumbers. Opie’s Gifts, Dave the Honey Guy and Glen Haven Farms will also be here on this beautiful morning. A very talented young woman, Amanda Ashley will be in our entertainment tent with her guitar and beautiful voice. Please stop down and see us! Always, Great Local offerings, and just plain GOOD PEOPLE!